Hello. I want digital signing oficial documents but i can not do it. 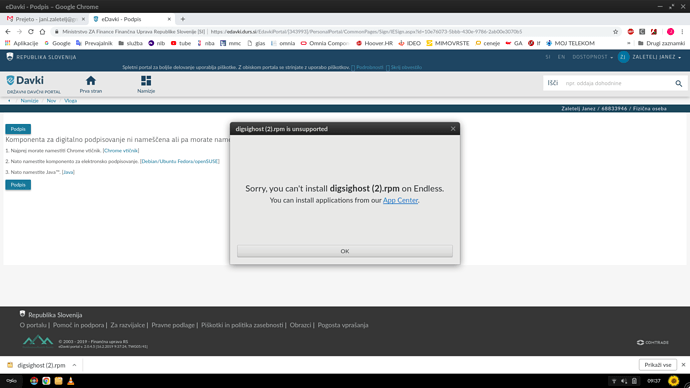 Because Endless do not suport this application. Is there a specific digital signing application you need to use? i m sending you a print screen of applications. I really need this one. Sorry, none of the package formats offered by that publisher are supported on Endless OS. You could contact them and ask them to publish a Flatpak version (which might make it easier for them to support different Linux distributions). Otherwise, you may be able to find someone in the Slovenian Linux community who could help you make an unofficial Flatpak.